Adjunct Professor Don Lincoln is the 2013 recipient of the Outreach Prize from the European Physical Society, High Energy Physics Division. The University of Notre Dame’s International Studies office has announced that it will offer three new opportunities for study abroad in South Korea, Spain and Switzerland in spring 2014, providing new options for students who want to study science and engineering abroad. Jennifer Tank of the Department of Biological Sciences was selected by a faculty committee to receive the 2013 James A. Burns, CSC Award, and Kathie Newman, of the Department of Physics, was selected to receive the 2013 Director of Graduate Studies Award. Colin Jessop, professor of physics, was recently appointed to two research management positions at CERN in Geneva, Switzerland. CERN is the world's leading high energy physics laboratory and home of the Large Hadron Collider (LHC). Juniors Daniel Irvine and Rebecca Marton have been named 2013 Barry M. Goldwater Scholar. They were selected from thousands of applicants to receive the prestigious Goldwater Scholarship for the 2013-14 academic year. Oncologist Rudolph M. Navari, M.D., Ph.D., FACP, associate dean and director of the Indiana University School of Medicine-South Bend and an adjunct professor of chemistry and biochemistry at the University of Notre Dame, has received a $2.1 million grant for a national study to address chemotherapy-induced nausea and vomiting (CINV). Prashant Kamat, The Rev. 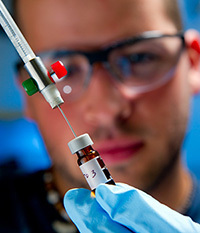 John A. Zahm Professor of Science, has been named a 2013 Langmuir Lecturer. Kamat will deliver a plenary lecture in a special session of the Colloid and Surface Chemistry Division program at the 246th ACS National Meeting in Indianapolis in September. At the annual Dooley Society meeting on April 20, representatives of Cleveland Clinic Innovations (CCI) presented about the Healthcare Innovation Alliance, which the University of Notre Dame joined early last year. The alliance includes centers across the United States, including the Innovation Institute of California, North Shore-LIJ Health System of New York, MedStar Health, and Ohio State University. The 2013 Outstanding Graduate Student Teaching Award, which is given annually by the Notre Dame Graduate School and the Notre Dame Kaneb Center for Teaching and Learning, honors graduate student instructors and teaching assistants whose teaching demonstrates excellence in the classroom or laboratory. “A five-planet system with planets of 1.41 and 1.61 Earth-radii in the habitable zone of a K2V star has been detected with the Kepler spacecraft and validated with high statistical confidence,” the paper reports. Those two, named Kepler-62 e and f, are the outermost of the five observed planets and receive a solar flux from the star similar to that received from the Sun by Venus and Mars. Their size suggests that they are either rocky, like Earth, or composed mostly of solid water. Six University of Notre Dame science students and four alumni have received National Science Foundation (NSF) Graduate Research Program (GRFP) Fellowships. 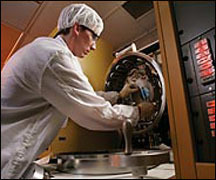 The NSF GRFP was created to enhance the scientific and engineering workforce in the United States. The fellowship provides three years of support for the graduate education of students who have demonstrated the potential for significant achievements in science and engineering research. Past NSF Fellows include individuals who have made significant breakthroughs in science and engineering research, as well as some who have been honored as Nobel laureates. “Spark,” a student-run conference focusing on University of Notre Dame research, commercialization and entrepreneurship, will take place Tuesday (April 16) in the Jordan Auditorium of the Mendoza College of Business. The organizers of Spark hope to demonstrate the possibilities of research at Notre Dame and to highlight projects that have the potential to become viable businesses. They hope to “spark” intellectual curiosity in all Notre Dame undergraduates and present them with opportunities and tools to get them involved in these projects in the future. The event features 12 speakers delivering 15-minute lectures from 2 to 6 p.m. A reception will take place from 6 to 8 p.m.
Wolfgang A. Herrmann, president of the Technical University of Munich, will present the Nanovic Forum at 5 p.m. April 9 (Tuesday) in the Jordan Hall of Science at the University of Notre Dame. The lecture, titled “What is an Entrepreneurial University? A Case Study,” is free and open to the public. Gregory Crawford, William K. Warren Foundation Dean of Notre Dame’s College of Science and professor of physics, will present the introduction. Under the direction of Herrmann, the Technical University of Munich has dramatically increased student enrollment, the number of full-time female professors and the levels of external funding. Germany’s Excellence Initiative has recognized the Technical University of Munich twice in the last decade as a University of Excellence.